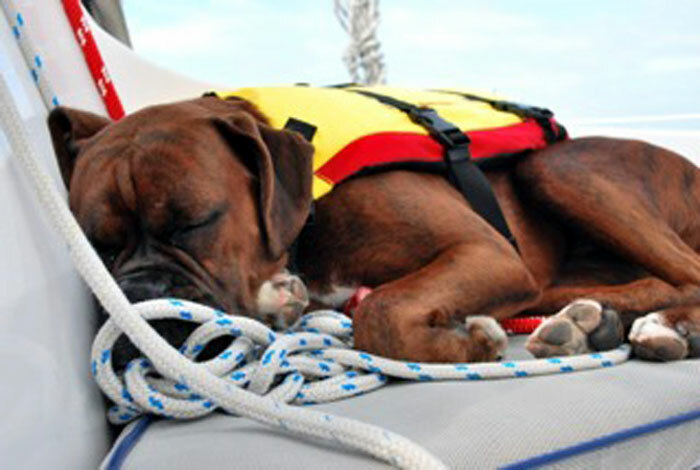 AVALON — When boater Owen Brown offered a treat to his four-legged sail mate, Piper, he expected the boxer to eagerly retrieve the snack and stick around for more. Brown knew right away that something was wrong when Piper refused the treat and instead curled up in a stateroom. “We just knew something was not right,” said Brown, who sailed to Catalina Island on his 36-foot sailboat, Poobah, Feb. 25. Brown, his parents and his wife, Patty, started Feb. 28 with a day-hike up Hermit Gulch Trail, where Piper appeared to enjoy traversing the rugged path with the couple’s chocolate lab, Scout. Back at the boat, Brown found about 24 ticks on Piper’s coat, removed them all and sent the dogs into the water to enjoy a swim. Afterward, the couple noticed a change in Piper’s behavior. The usually energetic and attention-loving dog seemed drained and kept away from everyone on board. By 7 p.m. Thursday, the 4-year-old dog was unable to keep anything down and had difficulty breathing. As a second-time visitor to Avalon, Brown was unfamiliar with the Animal Hospital of Catalina, which has been on the island since 2005. Denney, the island’s sole veterinarian, has more than 20 years of experience. He headed to the facility after learning of Piper’s condition. By 9:30 p.m., Brown was explaining Piper’s symptoms to Denney, who advised the owners to bring her into the office. After a dinghy trip from the boat to the green pleasure pier and a short walk to the clinic, Piper was in Denney’s care. Denney cared for Piper throughout the night. A blood test indicated she was dehydrated, and Denney administered an IV and medication to bring her back to a healthier condition. Piper began to show signs of improvement in the early morning and was able to walk again when Denney deemed her to be in stable condition. He advised Brown to seek treatment immediately once the boaters got back on the mainland the next morning. The knowledgeable vet drove Brown and Piper back to the dinghy, where they motored back to the boat at 3 a.m.
By 7 a.m., Piper was short of breath once again. Brown knew they had to head back to San Pedro. “We didn’t know what to do, because there was no vet on the island since Dr. Denney left that morning on vacation. So, we figured the best thing we could do was go home,” he said. But getting anywhere quickly on a sailboat is not always possible. Knowing it would take four hours to get home, Brown called the Coast Guard while sailing back to Cabrillo Marina, in hope that they might be able to send an emergency vessel. Strict policies restrict the agency from rescuing pets, but Coast Guard officers did what they could to try and locate a power boat in the area that could assist the ailing Piper. “I didn’t know if she would make the trip home,” Brown said. Piper was syringe-fed water and Pedialyte as they sailed toward the marina, but she did not seem to be doing any better. Brown was in constant contact with Coast Guard personnel, who were calling nearby humanitarian organizations and harbor patrol agencies to try and find a way to help the troubled pet. The Coast Guard was able to contact Cabrillo Beach lifeguards, who agreed to meet Brown’s vessel once they were 4 miles from shore — a plan that would work as long as the agency did not receive any emergency calls during that time. With a plan in place and the boat 10 miles from shore, Brown called his friend and slip neighbor, Doug Grant, to let him know what was happening. When Grant asked what he could do to help, Brown responded that he needed someone with a really fast boat. Grant called back minutes later to let him know he was on the way on his Shamrock 26 sportfisher. He was at the scene within 45 minutes. Brown carried Piper onto Grant’s boat, Buster, and the boat took them back toward the harbor at 20 knots. With the fast ride home, Piper made it to the emergency room at Animal Emergency Referral Center in Torrance within 30 minutes. Being at the veterinarian hospital was a déjà vu experience for Brown. “For the second night in a row, a doctor told us Piper was lucky to be alive,” he said. Piper stayed a night at the hospital and was able to come home on March 3. Brown was told an allergic reaction to a bee sting, pollen seeds or a jellyfish sting may have been the cause of anaphylactic shock-like symptoms. The nightmare of an experience will not keep the couple from returning to the island with Piper and Scout, especially since they know that Denney will be there to tend to their beloved dogs, should something happen. The Animal Hospital of Catalina is located at 208 Metropole Ave. in Avalon. Denney provides the island with a full-time clinic serving clients 24 hours a day. He maintains regular office hours Monday-Thursday and can be reached at (310) 510-1210.